When I decided that I wanted the job with Emirates, I did as much research as I could online beforehand. Everything from reading the Emirates Careers website, to reading blogs and forums with first-hand experiences of people who were already living their dream in Dubai. As I was living in Austria at the time, it was fairly easy for me to travel to an open day in Europe, and when I saw one pop up in Munich (around 5 hours away by train) I applied online straight away. I actually didn’t hear back at all, but since it was an open day anybody could come along, so I arrived the day before ready for an early start the next morning. I made sure to wear my smartest outfit (although I didn’t wear heels, which I believe are necessary now but weren’t when I attended) and had been practicing tying my hair up in a donut bun for weeks! The day started at 9am sharp, and I was there with plenty of time to spare as I’d heard that if you’re even one minute late the doors will be closed and you won’t be let in. There were around 50 people, which felt like a lot at the time (especially as everybody else looked so glamorous and ready for the job already!) but which I know now is fairly small in comparison to a lot of open days. I was probably the most nervous I’ve ever been, but I tried to hide it behind a big smile! The day started off with an introduction from the two recruiters, and a video of life in Dubai. We were then all asked to drop off our CVs, and all got a sticker with our name and a number on. The recruiter also asked how many languages I speak (English, German & Spanish – although of course only English is required, any others are always a bonus). After the CV drop off we were split into two groups and had some time before our group assessments got started. Our group was given the task of introducing the person sat next to us, and while this was going on we also took part in the “reach test” to make sure we could reach 212cm. (If I’m not mistaken there is now a minimum height requirement as well). Anybody who couldn’t reach was immediately sent home – luckily I’d made sure to check beforehand at home, although I was still nervous that somehow their 212cm would be different to mine! Next up was the first “elimination round” – we were all called up by our numbers and given a piece of paper which stated whether or not we were through to the next round. My heart was beating so hard! Once again we had another group task, which was to discuss what we would do with a million dollars. Between us we all contributed some ideas, and someone was picked to present the final ideas to the recruiter. Having read plenty of experiences of open days online, I knew that this task was more about how you communicate and get along with others in the group than the actual outcome. You’re being observed the whole time, and it’s usually the ones who are trying to dominate the conversation who end up going home after this round. It’s definitely a good idea to have a say, but make sure others have plenty of time to speak. The next part of the open day was an English test – being an English native speaker this was very easy for me, with some simple questions to answer and a small essay at the end. During the whole process, if you get a piece of paper that says you’re eliminated, you are not allowed to ask why you haven’t passed. At least if you fail the English test, you know what you need to improve on before trying again. By this time I think about half the initial group had already been sent home, and we were once again split up into two groups. It was time for another group discussion, this time we had 8 passengers, 6 of which would have to be downgraded to economy. Between us we had to decide who and why, and once again this was more about how you communicate and get along with others in the group, than the outcome of the task. After this round it was time for another “elimination paper”, and we were left with the final 13. All 13 of us had made it through to the final interview! I was honestly so ecstatic at this point! Everything I had been working up to was finally happening. We had some paperwork to fill out, and were given a link for an online personality test to do that evening. My interview was scheduled for the next day at 11am. The online test was quite a few questions to answer (multiple choice), but not difficult. The next morning I was at the hotel where the assessment and interview were being held with plenty of time to spare. Once again, I did not want to be late and miss my slot! The interview was pretty detailed, and I was asked lots of questions about my previous work experiences. Once it was over, I was asked to send in a few more “casual” photos, and was told I would hear back within 4-6 weeks. Possibly the most nerve-wracking wait ever! I honestly wasn’t sure if the interview had gone well. Although I’d been working since the age of 15, it had always been more causal jobs such as waitressing, so this was my first interview for a “real” full-time job! I logged on to the portal where my interview details were every single day, hoping that something would change. Eventually, two weeks to the day, I looked at my phone to see a missed call from a strange number… I called back and was absolutely shocked and ecstatic to hear that I was being offered the job! My heart was beating so fast during that phone call, and I was so happy! They gave me just over 2 months before the big move to Dubai, and I just couldn’t wait to get out there and start flying. Although the open day (which then turned into the assessment day) and final interview the next day were two of the most stressful days ever, when I look back now I am so happy with how they went. I barely even remember the nerves I felt (although they were very much there!) and I am in love with my job more than ever! All I have to say to anyone who is thinking of applying for Emirates – go for it, and good luck! 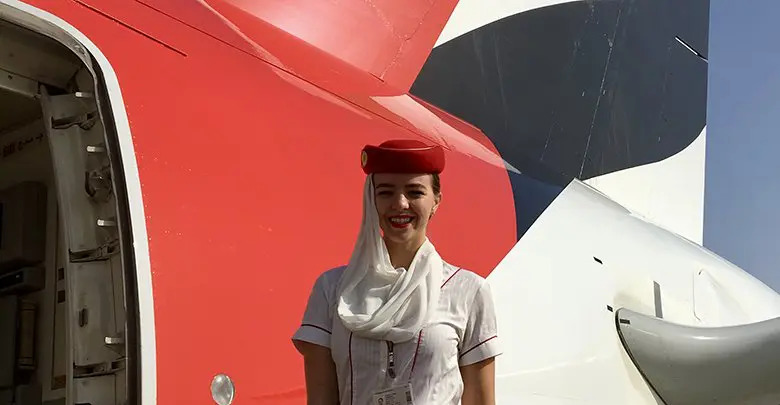 I’m a flight attendant at Emirates, one of the world’s largest airlines, and travel around the world for a living. It’s the best job in the world, and I wouldn’t change it for a thing!